Following a vegetarian, vegan or plant-based lifestyle has become extremely popular in today’s culture. Whether for health, sustainability of the planet or animal rights, the number of people adapting a plant-based diet is at an all time high. If you are a vegetarian, it is usually not difficult to consume a nutritious diet as you can omit the meat in restaurants, but still include dairy foods, such as milk, cheese and yogurt and eggs. If you adhere to a vegan diet, it can be a little tricky to meet your nutritional needs, especially when traveling, without some careful planning. People that are vegan do not consume any foods derived from animals. That means no meat, dairy or eggs. Many vegans also exclude honey from their diets. If you follow a vegan diet and enjoy eating in restaurants, you may become familiar with the various establishments in your locale that offer vegan menu options or will oblige special requests and modify dishes to meet your needs. However, when you travel abroad you may find it difficult to find restaurants that will satisfy your vegan preferences. Google websites for vegan restaurants where you are traveling. You should find this quite helpful. Also be aware that you can order a vegan or vegetarian meal for your flight, but do so at least 48 hours in advance. You should be able to do this on the airline’s website. If you follow a vegan diet exclusively, you should be aware that there are a handful of nutrients that you need to pay special attention to so you don’t develop a deficiency. These nutrients include protein, Vitamin B12, zinc, iron and calcium. Almost all foods except for alcohol, fruit, sugar, and fat provide some protein. Protein’s role in the diet is to repair cells and make new ones. Protein is also important for growth and development in children, teens, and pregnant women.Vegan protein sources include: lentils, chickpeas, tofu, peas, peanut and other nut butters, soy milk and protein-fortified almond milk, almonds and other nuts, peas, seitan (wheat gluten), edamame and tempeh. Vitamin B12 is required for the formation red blood cells, neurological function, and DNA synthesis. Vitamin B12 is predominately found in animal foods. It can be difficult to get sufficient amounts from plant-based foods. If you are traveling, it may be wise to bring a package of Red Star nutritional yeast that you can add to foods for protein and Vitamin B12. Two tablespoons of nutritional yeast contains only 45 calories, but has 6 grams of protein and 100% of the RDA for Vitamin B12. If you bring a small container of it to restaurants, you can add it to soups, pasta, rice and stews. Zinc has many important functions in the body. It’s needed to maintain the body’s immune system. Zinc is also required for cell division, cell growth, wound healing and the digestion of carbohydrates. Zinc is also essential for both smell and taste. During pregnancy, infancy, and childhood the body needs zinc to grow and develop properly. Plant-based food sources of zinc include white beans, kidney beans, and chickpeas, zinc-fortified breakfast cereals, wheat germ and pumpkin seeds. While traveling, try to order entrees which include beans when dining in restaurants. Iron’s role in the body is to carry oxygen to all of the cells. Iron sources for vegetarians and vegans include iron-fortified breakfast cereals, spinach, kidney beans, black-eyed peas, lentils, turnip greens, molasses, whole wheat breads, peas, and some dried fruits (dried apricots, prunes, raisins). For vegetarians, egg yolk is also a good source of iron. Calcium is the most plentiful mineral found in the human body. The majority of calcium is found in the teeth and bones. Nerve cells, body tissues, blood, and other body fluids contain the rest of the calcium. In addition to building strong bones and teeth, calcium also helps blood to clot, sends and receives nerve signals, and maintains a normal heartbeat. Calcium food sources for vegans include calcium-fortified soymilk, calcium-fortified breakfast cereals and orange juice, almonds, tofu made with calcium sulfate, and dark-green leafy vegetables, including broccoli, collard, turnip and mustard greens, bok choy. Vegetarians can get adequate calcium from milk, cheese and yogurt. If you are a vegan and traveling, don’t forget to bring a multiple vitamin/mineral supplement that is 100% of the Daily Value (DV). Taking a daily multiple vitamin/mineral supplement that provides sufficient amounts of Vitamin B12, calcium, zinc and iron is a good way to ensure adequate nutrition while you travel. 1. If the restaurant doesn’t have a vegan option, request a vegetable plate. 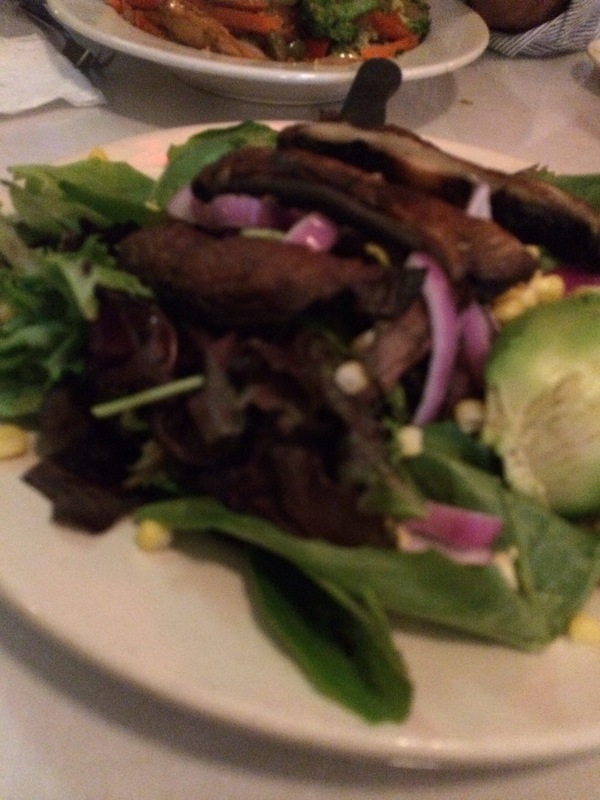 If there is a salad that includes meat or cheese, and no vegan option, request that the meal and cheese be omitted. Ask for beans and/or avocado to be added. 2. Bring packets of oatmeal, bags of nuts and vegan protein bars from home when you travel. 3. Download Happy Cow, the free app for iPhone, to find vegetarian and vegan restaurants around the globe.